Count no man happy until he is dead. If that is the case, my child Garcia is now happier than I have ever been, after only six months of life. I am unsure if the infants of Purgatory are Catholic doctrine yet, but if they are, I wish him a swift passage through the darkness and to the throne of glory. Amen. Five years and almost nothing accomplished. I am slothful, as well as a little bit shy now, but this is ridiculous. Bringing a recalcitrant bishop to heel is barely a drop in the bucket that must be filled. Despite my retiring nature, I need to steel myself for greater things if I am going to seize a crown of my own! First step, marry a second wife — rather, a third wife according to history, but whatever. 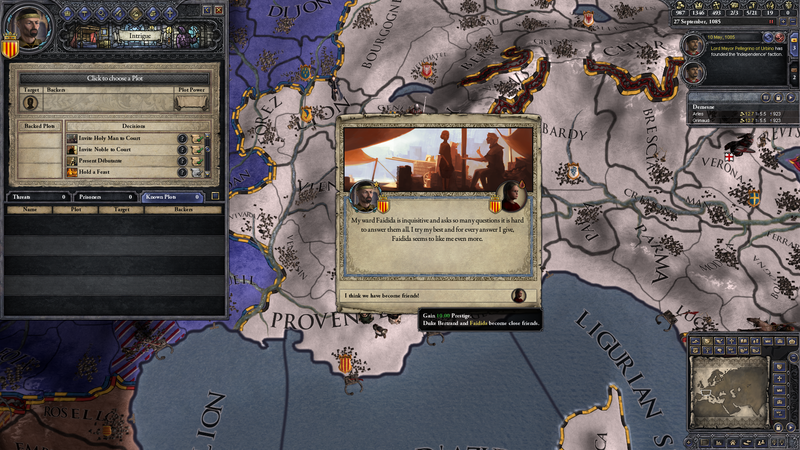 Since I have royal pretensions, only the kinswoman of an emperor is suitable for me. 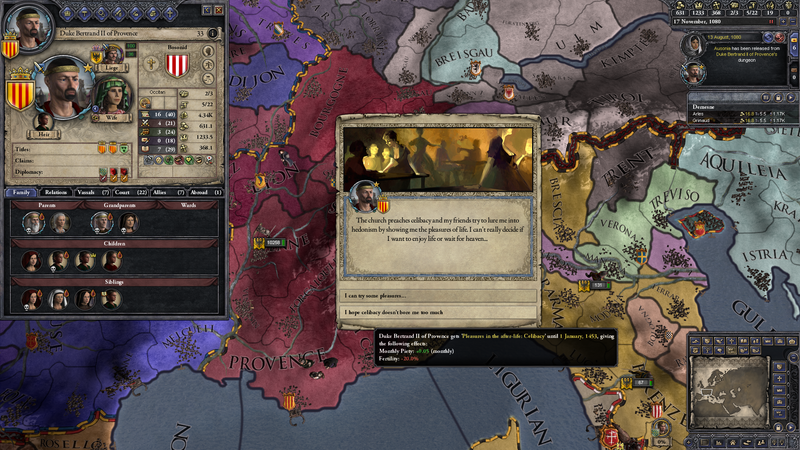 My cherished liege, Henry IV Salian, does not see my stature sufficient to marry even his sisters or nieces, so I turn to the other Rome, ruled by Constantine X Doukas. I marry his daughter Anna, a genius by all accounts and well enthused at the prospect of being a future queen, at least once the bride price arrives. To cement the bond between the Bosonids and the Doukas, I marry my other sister to Anna’s brother Andronikos, who is a typical Greek insofar as he is very skilled with money. A dual wedding, the best way to ensure eternal friendship between two houses! It almost salves the wound of Andronikos’ prompt lynching when the peasants were terrified of his strange words and ways. Oh well. In what is quickly becoming our house motto, whatever! I have the marriage, I have the money, so now it is time to make clear to all my ambitions. 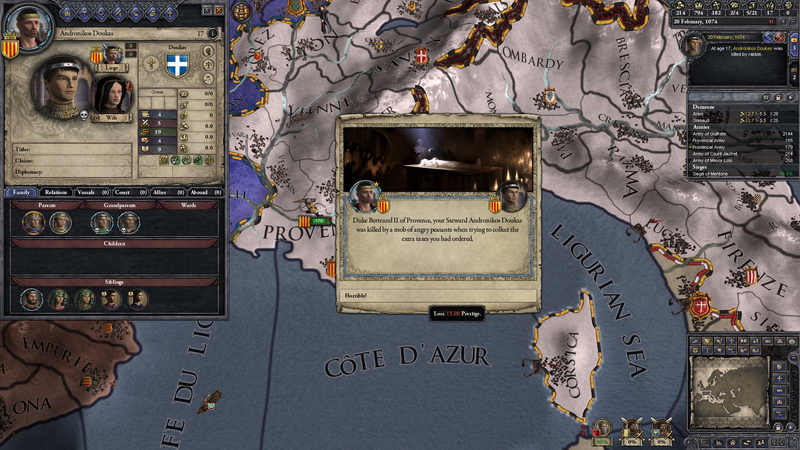 From now on, Bertrand of Provence will style himself King Bertrand of Provence. Surely recognition will follow. As if blessed by God Himself, Anna and I fall deeply in love and soon have a son. I name him Acfred, a familial name of the counts of Carcassonne, as a small atonement for the murder of my sister near those mountains. He is my beautiful boy and I will treasure him for all time. He is also born sickly, though not quite so much as the pneumonia of the dearly departed Garcia, so I began a strict regimen of fasting and chastity to speed his health. The priests of my court, especially the bishop of Nice with his powerful sacral knowledge, tell me that this is pleasing to the Lord, who does not want to see us become too closely tied to earthly things. I can see what they mean, for my son is manifestly a gift from heaven! The rewards are quick in coming. My first daughter by Anna is a bright and loving child. We quickly become best friends, despite over three decades separating us. I expect great things from this young lady. Children really are a joy! I am beginning to wonder whether the unlucky years of my first marriage, especially her childlessness and then death in childbirth, were a result of Mathilde’s sin. Certainly, there is nothing like that between Anna and me! We even have a second boy, which I name Jaufret after my cousin, just recently departed from this earth. Of course, having him leaves me with some disquiet. 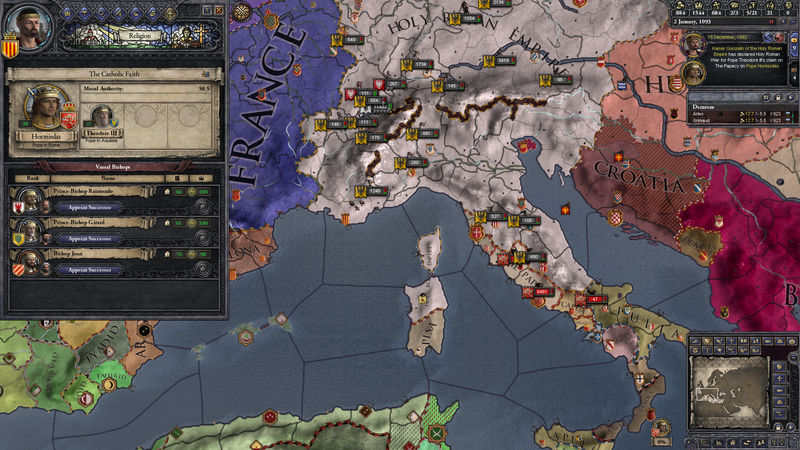 To be sure, Provence is wealthier than the lands of southern France and eastern Spain and it is safer than the war-torn lands of northern Italy and southern Germany, but it is nonetheless impoverished and threatened by the scourge of a partible inheritance. It pleased my forefathers to see their lands divided equally among their children, regardless of merit, but when I look north to Forcalquier, where my listless cousins rule, I think fearfully of what enmity could arise between Acfred and Jaufret after I return to the Lord. My fruit will not be a kingdom scattered to the winds. For now, I will choose Acfred as my heir in toto, but I will make it clear as I raise him that his brother is his charge just like he is mine. After all, that is the nature of lordship. A man might be elected to it, but he cannot elect which parts of it he wants for his own. Meanwhile, the world around me is falling apart. 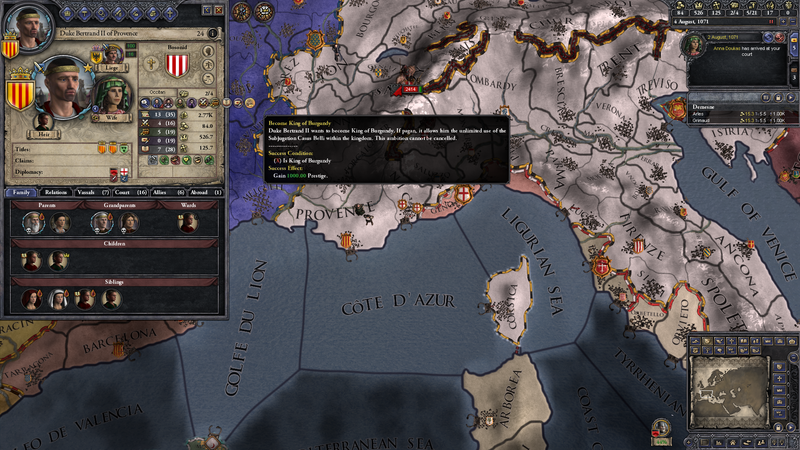 Some years ago, early in my reign, the Holy Roman Emperor raised an antipope, Theodore III of Aquileia, in opposition to the reform papacy that denied the supremacy of a lay emperor under heaven. It was of no notice to us in Provence at the time, but in 1093 the death of Pope Alexander II and the election of Pope Hormisdas II inspired Guzelin I Salian, the new Holy Roman Emperor, to install his candidate in Rome and end the schism. Who will be top of the popes? The war was not even a year in length. The might of the most Christian emperor was on display for all, and even the pleas of the beleaguered Hormisdas to turn it against the Saracens desecrating the birthplace of Christ beyond the sea fell on deaf ears. 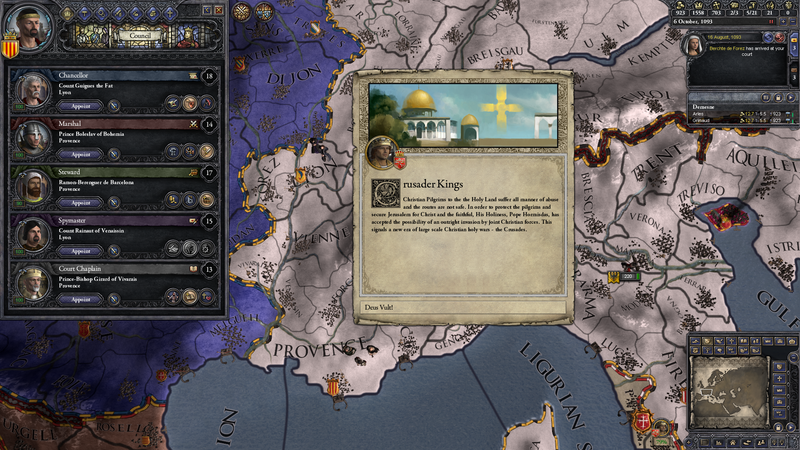 I could be a crusader king too? I doubt this brief controversy over investiture will even be remembered, a generation from now. The writings of the church fathers were just so clearly in favor of the emperor’s position. Render unto Caesar what is of Caesar… The earthly sword is the rule of law… Anyway. Hormisdas fled and gave his blessing to an antipope in the frontier kingdom of Castile before dying, but that fraud is of no account. The universal Christian empire is whole once more and forevermore.